Ozzy Osbourne hasn’t lost his bite. The rocker and his wife Sharon stepped out in Beverly Hills on July 23 to support Sharon’s The Talk co-host Holly Robinson Peete at the 13th Annual Design Care, an event that benefits Robinson Peete’s HollyRod Foundation. The evening, which featured a live auction and helps families coping with autism and Parkinson’s disease, went raucously for the Osbournes, who started a bidding war for a Yorkshire terrier puppy — and won! The bidding started at $5,000, but Ozzy continued to outbid everyone in the room, and the auction eventually ended with the singer’s final offer of $10,000. 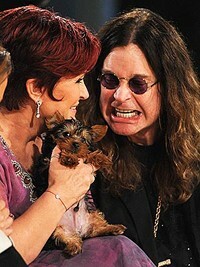 Both Sharon and Ozzy, who clutched their new puppy in their arms, looked thrilled. And who could blame them? The tiny Yorkie’s name, as if it were meant to be, was Ozzy.